Hurry up and find your way out of the spooky vampire maze! 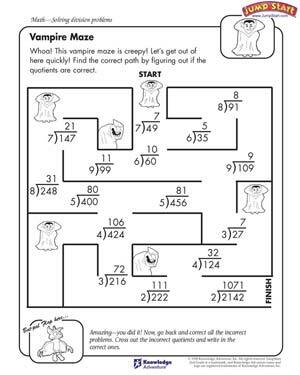 Use your division skills to find your escape route in our ‘Vampire Maze’ worksheet. In this worksheet, kids will need to look at each of the solved long division problems and check if the answers are right. They will need to follow all the problems that have been solved correctly to get out of the maze!